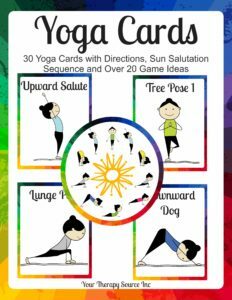 With the popularity of Trolls in full swing right now, I though the kids would enjoy some Troll yoga poses. 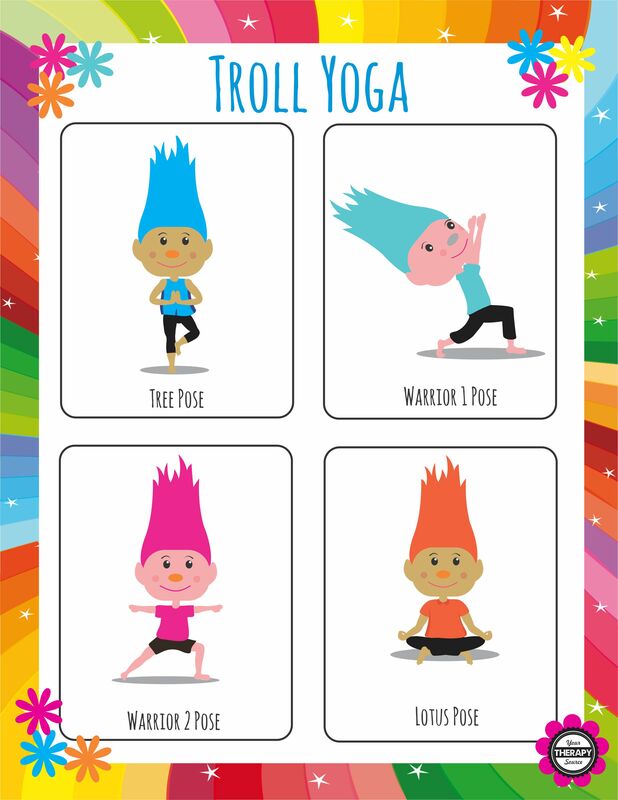 These Troll yoga poses are beneficial to increase focus, concentration, balance, core strengthening and relaxation. Download your free Troll yoga poses below. 1. Find a point to focus on with your eyes. Place your right foot on the inner part of your left leg. Steady your balance. 2. Bring hands together (prayer hands) at chest and slowly lift overhead. Hold the position. 1. Stand with the feet together and arms at side. 2. Step back with the right foot back about 3 feet and bend the front, left knee. The left knee should be directly over the left ankle. The right foot should be flat, heel down and turned out. The feet should be about hip distance apart. 3. Lift both hands overhead. Reaching up with the fingertips toward the sky. Keep the shoulders relaxed and down. 4. Take several deep breaths while reaching up, stretching and lengthening the back. 5. Step the right foot back up to the left foot returning to feet together, arms at side. 6. Repeat on the other side beginning by stepping back with the left foot. 1. Start in a downward dog or mountain pose. Bring the right leg forward, bend the right knee and extend the left leg back. Place the right foot flat on the floor so that the legs are in a lunge position. 2. 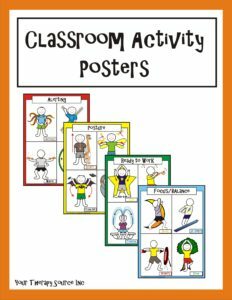 Move into standing, reach the right arm forward and the left arm back at shoulder height. Keep the front leg directly over the ankle. 3. The shoulders and hips should be facing the left with the back elongated. The shoulders should be directly over the hips. The head should be turned forward and maintain a focus point with the eyes. 4. Introduce self confidence at this point in the pose. Repeat positive affirmations such as “I am strong”, “I am confident” or “I can remain focused”. Take several deep breaths. 5. Reverse the feet and repeat the pose. 1. 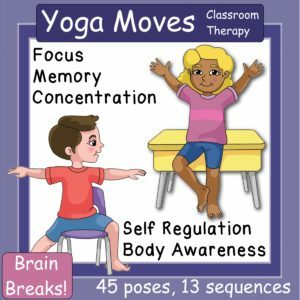 Sit on the floor with the legs stretched out in front of you and keep the back straight. 2. Bend the right knee and place it on the left thigh. The bottom of the foot should point upward and the heel should be close to the belly. 3. Bend the left knee and place it on the right thigh. Remember to keep the bottom of the foot up and the heel next to the belly. 4. Keep the back straight and put the hands, palms up, relaxing on the knees or bring the hands together and chest level. 5. Hold the lotus pose and take deep, gentle long breaths in and out. 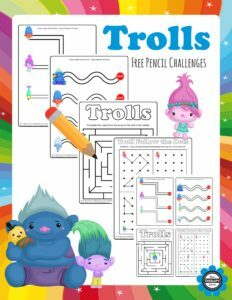 DOWNLOAD your FREE Troll Yoga Pose page. 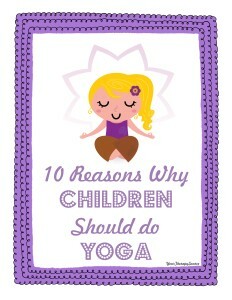 Need more yoga ideas for kids?